There was much work to complete following our test run at Mallory Park on the 6th of June before I could hope to run the bike on the 22nd of June at Schleiz. Cylinder head leaks, slipping clutch & poor throttle response below 4,500 RPM being only some of the many issues which required to be fully addressed before RM64 could be expected to run at its 1964 performance level. With much help from MM and others we slowly worked through the issues one by one and were still working on the bike right up until the evening before setting out for Schleiz – not the ideal way to go racing! According to my Honda CRV Sat Nav, the distance from the end of my drive in Chester to the starting line in Schleiz is 847 miles and the Sat Nav was right! Apart from the almost non-stop rain, the trip to Schleiz went without any problems and I arrived as planned on Thursday 21st June 2007, having averaged 59.8 MPH and 34.6 MPG. Booking into the Hotel Luginsland recommended by Klaus Schreiner the race organiser, I immediately knew I was in for an entertaining weekend but little did I know just how entertaining! I was soon to discover why the Hotel was fully booked up for the whole of race week and for next year too and then only by invitation! On Friday the rain at last stopped and I was very keen to get started being one of the first to reach the pre race assembly area when the cylinder head gasket just popped as I accelerated onto the track! — the bike had been test run up to 7,800 RPM (we did not wish to take it any higher with new piston and rings) on the Dyno at Quill Engineering without problems the day before I left for Schleiz, so you can imagine my disappointment — no practice for me this day! The assistance offered to me by Klaus and many of the competitors in the paddock who could see I was having problems was just fantastic and I was able, with their help, to rebuild the engine and be ready for the final official timed practice session the following morning when it just rained, rained and rained. Many riders did not go out because of the conditions and their earlier lap times were accepted! For me I had no other option but to get out to qualify, my best recorded lap time being some 12 seconds per lap slower than the guy in front of me and 38 seconds slower than the fastest rider on a 500 who had qualified in the dry! Nevertheless,it was just great to be up and running notwithstanding an impossible to control Parilla clutch which would drag or spin when not expected seeming to have a mind all of its own! Interestingly the clutch problems led to me discovering that the engine would rev to 9,000+, sooner than I had planned! Race day came and the rain stopped at last. 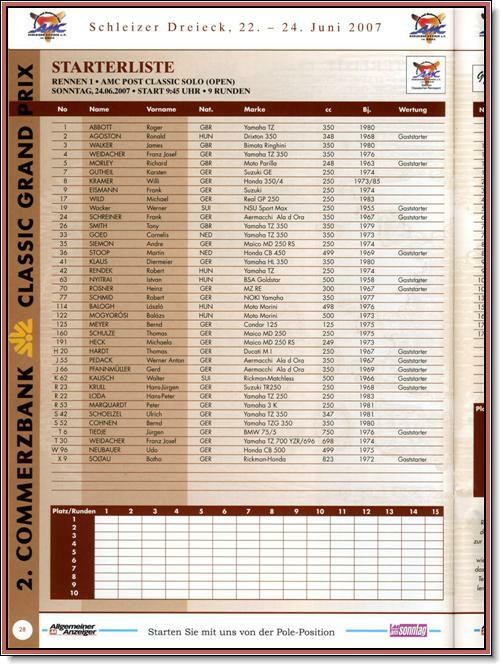 According to the program, the Classic G. P was to have been a bump start however for some reason or other the organisers decided at the last moment to change the race to a clutch start. I only wish they had told me as I had already arranged for 2 pushers from the back of the grid which carried a 20 second penalty! First race of the day we did 1 warm up lap then once back on the grid the flag dropped and they were away, all that is but me! 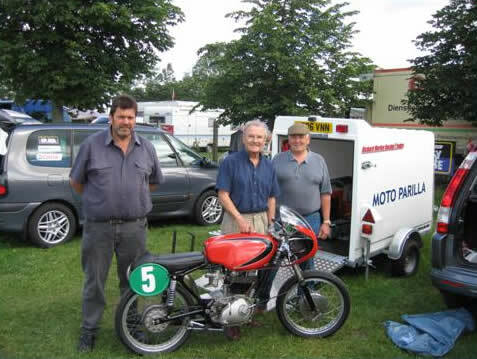 — my pre arranged pushers having heard it was to be a clutch start just retired to watch the racing! Eventually, after the other riders were almost out of sight a race official pushed me away and I was off now even more determined than ever to catch up and get to the front! Some things never change, not even after 42 years! Though last getting away at the start, it was still a great relief and with a dry track I was soon beginning to enjoying myself. At the start of my second lap I spotted 2 stragglers ahead and had no trouble in passing them. By the end of the second lap I spotted another bunch of riders ahead whom I was closing on very rapidly when on the fast back half of the circuit but they all soon disappeared each time I came to the tight hairpin bend and the two tight chicanes on the slowest parts of the circuit. These were the places I was having most difficulty with the clutch combined with carburettor problems which we had not unfortunately fully resolved. On lap 6, I was passed by the leading rider on a 500 Honda (I think)? followed by a 350 Bimota Ringhini ridden by James Walker (the eventual winner) both these bikes were extremely quick on the straights and out of the bends, gaining over 100 yards on me at each tight bend, however on the straights and fast curves my Parilla did not lose out too much, that was until I put on to much throttle and the clutch just spun with my revs passing 9500 before I could close the engine back down again! On lap 7 (my last lap) the engine head gasket blew once again and that was that! Though still running at the back of the field when my engine cried enough, I would have been more than happy with that if only I had finished the race, but that was not to be! What might have been? On reflection, if I had been told on the Friday evening, the day the head gasket had blown just as I was going out for practise, that I would start the race and complete just 6 or 7 laps of the Classic G. P, I would have been delighted, however I had very mixed feeling following my retirement as I knew things could have been so much better if only I had had more time to practise and sort out the known problems (clutch & carburettor). I know I was and felt very rusty riding through the tight and slower bends, but pleased that I had not forgotten the line or the feeling of ‘flying the bike’ through the faster sections of the circuit. The reaction from the spectators and other competitors on my return to the pits (standing on the top of the breakdown truck with my bike)! was a little overwhelming and I did not know if I should laugh or cry, I hope I avoided the latter! 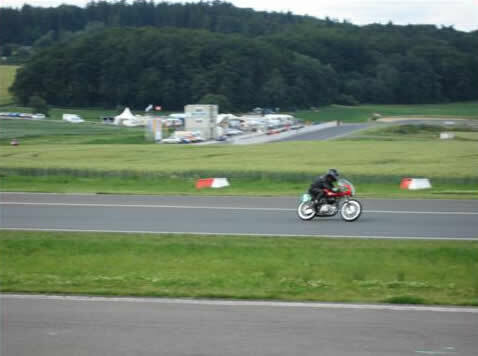 Among the paddock crowd were organisers for classic races at the Sachsenring (Germany) A Ring (Austria) and Pistany (Czech Rep) who offered me starts in their upcoming 2007 and 2008 races — but no start money! 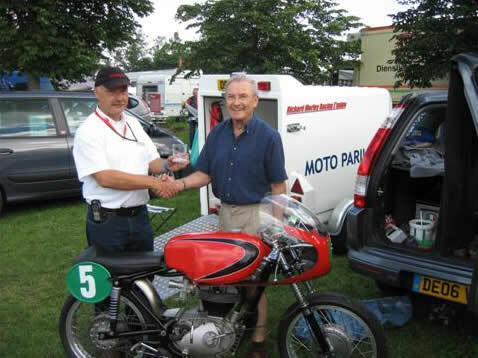 As hard as it was, I just had to decline their kind invitations for this year but indicated I might enter in 2008 subject to getting ALL of my Parilla problems sorted – I would not go all that way again on to the Continent unless I had a completely sorted bike and a fully tested spare engine, gearbox and clutch unit . Impromptu fancy dress, helicopters flying in the main dining room, the story I could tell regarding the customers and staff from the Luginsland Hotel and the things they get up to, well! 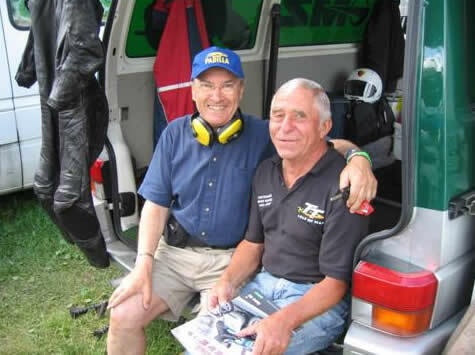 — some regular customers who had no interest, from what I could see, in bike racing, come back year after year just to see what the Luginsland riders and their sponsors all get up to in the evenings and well on into the following mornings! I had better not put too much of this part of my story into print to save any embarrassment to the ‘entertainers and their supporters’ of which there were many. I have already booked my accommodation at the Luginsland for next year! I stayed on at the Luginsland one day longer than I had originally planned — the atmosphere there was such that I just wanted to enjoy it for as long as possible. Visiting the town of Schleiz the day after the races were all over was also interesting and I saw many groups of walkers setting off into the countryside which all around Schleiz is quite beautiful. 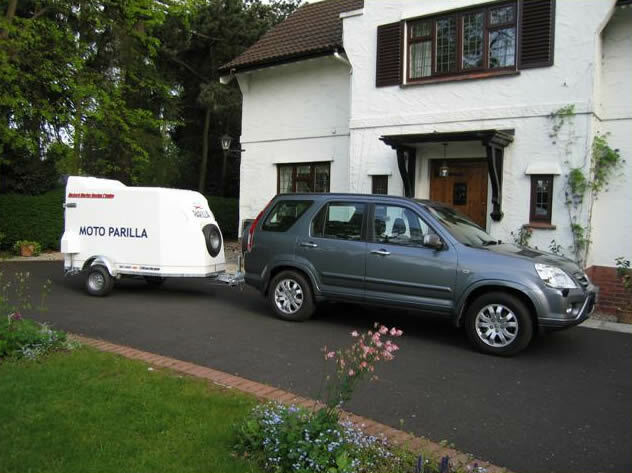 Reluctantly leaving the Hotel on the Tuesday morning but not before again contacting our web master Mike McGarry (MM) to request him to bring out another Parilla head gasket to Spa. My plan was to drive and stay one night at the Nurburgring before continuing on to Spa some 350 miles from Schleiz. I soon changed this plan when I encountered the most appalling rain which continued all day. Giving the Nurburgring a miss, I drove directly to Spa and was somewhat disappointed to discover that 3 out of the 4 local hotels being promoted by the Spa organisers were SHUT and not due to open until the following day! Eventually I found a comfortable B & B in the centre of Francorchamps and settled down for the night. Arriving at the Spa circuit the following morning, a day earlier than originally planned, I received a very warm welcome from the organisers and was given a guided tour of the new pit and paddock facilities which have been built over the past 12 months, primarily to accommodate the requirements of the F1 Grand Prix circus who are including Spa in the World Championships this year. The new facilities are very impressive but I have my doubts if they are enough to attract F1 back in future years, the competition now between the International circuits being so great. The following afternoon I was given my welcome pack by the organisers when I discovered to my surprise that I had been allocated one of the new F1 Pit boxes being allocated to past GP Riders and VIPs. The pack included invitations to various parties and reservations for diners at the most popular local Restaurants (Riders to pay)! Awaiting MM’s arrival later (Mike and his wife Urs were delayed many hours on arrival outside of the circuit) I met up with the same group of British riders and their sponsors that I had had the pleasure of meeting the previous year. That evening we all set off for ‘A Di Mama Di’ for diner when a very good time and meal was had by all, I must admit to putting on nearly 2 Kgs over the 2 weeks I was travelling! Feeling all alone the following morning I gave up my smart Pit Box (but not my F1 paddock pass which got me in and out of any gate and through the Tunnel under the circuit straight into Francorchamps) and joined the rest of our group in the lower paddock and then started work on fitting the head gasket Mike had brought out with him to my Parilla. Two hours later the job was done and we bump started the Parilla when once again the head gasket blew before I had gone 100 yards! Packing the bike away in the trailer I spent the rest of the time at Spa helping in the paddock and just watching the other riders perform — that is between eating and drinking! Our crowd all seemed to be riding well and their bikes kept going most of the time without any major problems. On the Saturday I planned to have a quiet evening at my B&B in Francorchamps but made the mistake of going into a local restaurant for just an omelette – I should have known there is no such thing as a quiet evening in Francorchamps during Classic Bike week! In no time I had been adopted by Graham Salter’s group. Graham who was also started his career as a tool maker now runs an Engineering Company which includes gearbox manufacture. He had 2 or 3 bikes at Spa and kindly offered me a ride on his 350cc TZ Yamaha for the following morning Sunday, the last day at Spa. As you can imagine, I did not sleep much that night! 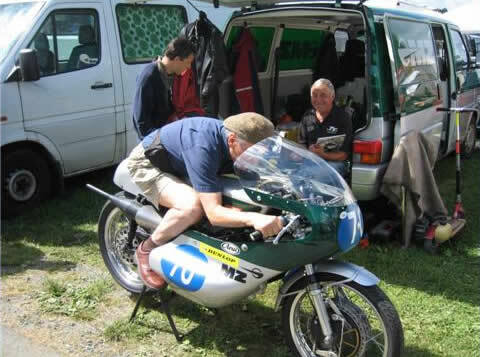 The following morning came and true to his word Graham had his mechanic readying his TZ for me to ride when I chickened out! Well, I had better explain – I have never enjoyed riding 2 strokes ever since I was thrown off a Scott 500cc twin which sized up when I was riding flat out on a public road. This happened when I was based at RAF Duxford whilst I was completing my National Service. I did not break any bones but it was 3 months or so before I could travel home or walk properly! On arriving at Graham’s pit the following morning his mechanic and friend Steve was changing the TZs radiator and informed me he was doing this as the bike had overheated whilst running the previous day! well, that was enough for me to bale out, Spa is not a place to ride I bike if you have any doubts about its reliability. But it was very generous of Graham to offer me the ride. That was the end of RMs first foray back on the Continental Circus & whilst the Parilla wasn’t as reliable as its rider development over the winter will resolve the head problems & move on to producing a more rideable machine. Since returning home from Spa, 2 cylinder heads were sent off for re-machining. We found that in their static state both heads had reasonable flat gasket contact faces but it was clear that through over tightening of the head nuts over the years, the bolt chimney flanges had become badly distorted which we think was the main cause for the gaskets blowing. For now, we are just having the chimney top flanges re machined flat but if this does not cure the problem we may be required to have the 10mm dia head bolt holes rebored and then fitted with capped bushes, there should be enough material in the heads to do this. A new Ducati type 6 spring racing clutch is now being manufactured and I am hoping with this plus the fitment of the original RM64 type 30 mm bore Dell’orto SS1 racing carb, things should improve all round, I sure hope so!